Exit polls marking the conclusion of the 2013 general elections are predicting that Prime Minister Benjamin Netanyahu has been reelected, but the vote's biggest surprised was the success noted by Yair Lapid's Yesh Atid party, which according to the polls won 19 mandates. Israel's news networks projected the joint Likud-Yisrael Beteinu ticket to have won 31 Knesset seats – a sharp drop from the 42 mandates that two parties currently hold. With 66% of the votes counted, the Likud has garnered 24.3% of the votes, Yesh Atid 14.2%, Labor 12.1%, Shas 9%, Habayit Hayehudi 8.4%, United Torah Judaism 5.7%, Hatnua 5.3%, Meretz 4.7%, United Arab List-Ta'al 2.9%, Hadash 2.4%, Kadima 2%, Balad 1.9% and Otzma LeYisrael won 1.6%. The winner of the day was the centrist Yesh Atid, whose projected number of mandates was almost double what the final pre-election polls predicted. Shelly Yachimovich, who in recent weeks voiced hopes of becoming Israel's next prime minister, failed to garner enough mandates to make Labor the country's second largest party, but according to the polls Labor has been able to secure 16 Knesset seats. Naftali Bennett's Habayit Hayehudi is believed to have won 11 Knesset seats. The results are expected to make it tough for Netanyahu to form a coalition, considering that the race between the Right and Left blocs was tighter than initially expected. The polls showed the the Right bloc won a combined 61 Knesset seats, while the Center-Left bloc won 59 mandates. 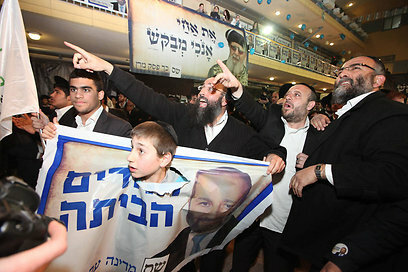 Shas was said to have won 12 seats, followed by Hatnua with six or seven. Kadima, the news network said, appeared to have failed to pass the minimum electoral threshold and therefore might not have representation in the 19th Knesset. 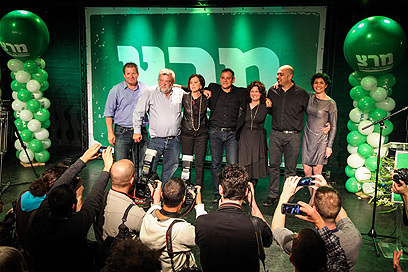 Meretz appeared to have doubled its power by winning six mandates, according to Channel 2. This is the biggest win for the party, which is headed by Zahava Gal-On, since 1999. The elections' final results are not expected to be announced until the early hours of Wednesday morning. Yair Lapid commented on the initial results with a single phrase posted on his Facebook page: "Thank you." Rabbi Shay Piron, Yesh Atid's No. 2, told Ynet that Tuesday's elections were a "historic event," noting that the party was initially slated to get only five or six mandates. Netanyahu attempted to downplay the fact his ruling party had significantly weakened. The prime minister thanked his constituents in a Facebook post, emphasizing his reelection. "According to the polls, the citizens of Israel asserted that they want me to keep serving as prime minister and to form the broadest coalition possible," he said. "These results pose an opportunity to make many changes that would benefit the Israeli public… Many challenges are ahead." Netanyahu pledged to launch efforts to form a government as soon as Tuesday night. As the results emerged, Meretz's Gal-On urged the centrist parties not to join the prime minister's coalition. "We have a mission: To start talking about peace again," she said. 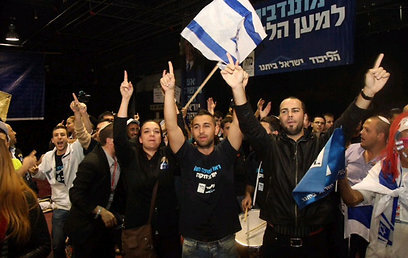 Officials with Habayit Hayehudi expressed contentment with the rightist party's gains, which mirrored predictions made ahead of the elections. "We promised that something new was starting, and today something new was started by the people of Israel," Bennett, the party's chairman, told dozens of supporters waiting outside his Raanana home. "We, Habayit Hayehudi, have returned to the center of the political stage." Members of Shas were equally pleased that they managed to preserve, and most likely to boost, the ultra-Orthodox party's power. "The people have decided to empower Shas," Avraham Kreuzer, a manager of the party's campaign, told Ynet. Sources close to Shas' spiritual leader, Rabbi Ovadia Yosef, said that he "heard the results and rejoiced before resuming his (Torah) studies." Hatnua Chairwoman Tzipi Livni thanked activists and told them that she "is back for good." "I will stay in order to complete the mission we have taken upon ourselves – to make Israel a country that is part of the free world and isn't closed off and isolated, a country that leads the process towards peace," she said, noting that her party deserved more Knesset seats. The number two on the party's list, Amir Peretz, said the Center-Right bloc can pose an alternative to Netanyahu. The final voter turnout on Election Day stood at 66.6%, the highest since 1999. Polling stations across Israel opened at 7 am on Tuesday, beckoning a total of 5,656,705 eligible voters to cast ballots in 10,132 ballot boxes across the country. The stations closed at 10 pm, allowing the count to begin. While the winner appeared to be pretty much decided, international media outlets on Tuesday pondered the implications of another Netanyahu administration for the diplomatic process. A Washington Post editorial claimed Netanyahu is one of only two Likud members who support the establishment of a Palestinian state, out of the top 30 candidates on the Likud list. The question, it said, was whether Netanyahu would include Center-Left parties in the coalition, or risk isolation both within his party and internationally. See all talkbacks "Polls: Netanyahu reelected, Lapid surprises with 19 mandates"